Maybe I'm going a little overboard here, but I think these skirts will sell. 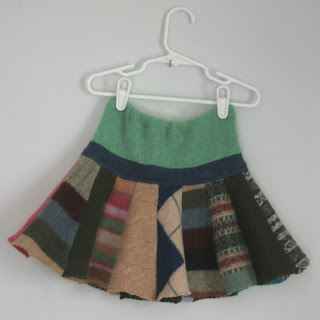 I've sold all the skirts I originally made, and these are way more fun than those were. So now when I'm cutting up a sweater into mittens or hats or whatever, I'm also cutting skirt panels and making stacks of panels for later assembly. This is the first one to be completed in this fashion, and I like the zaniness of all the patterns next to each other. It's a size 4-6 little girl's. I like all the patterns in this one. It made me smile. I can just imagine some little girl skipping along and singing to herself. One Week Till Market Season Begins!